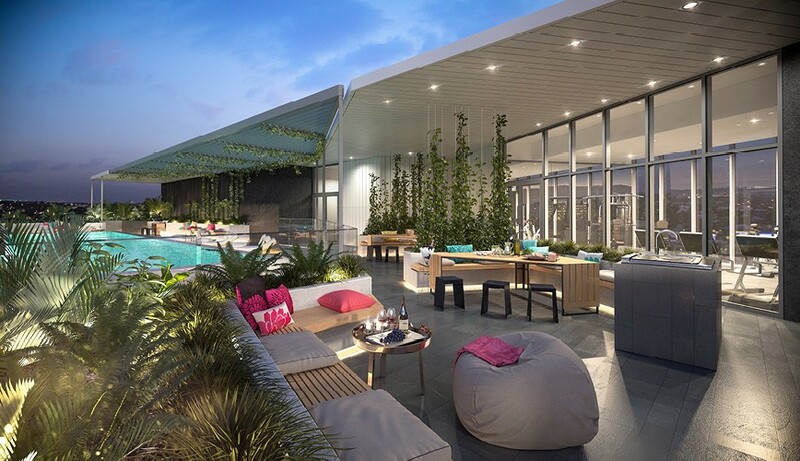 Park Central apartments is a $1 billion master-planned development in Woolloongabba and is located at 255 Logan Road. 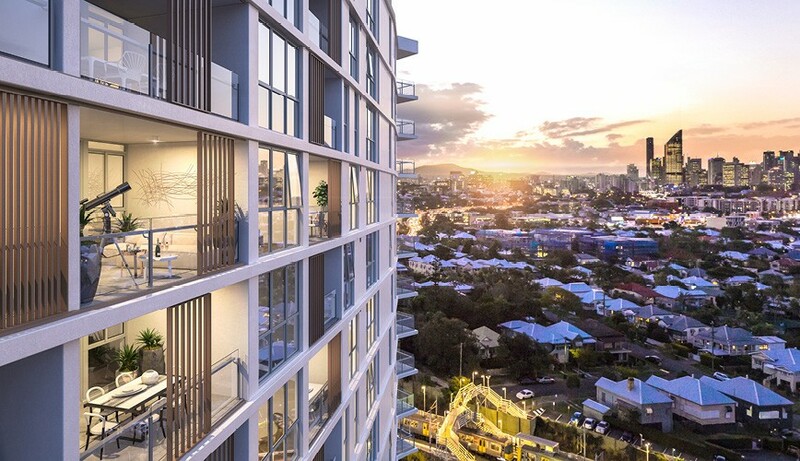 These master-planned Brisbane apartments are a true transit orientated development and will connect directly to the Buranda busway via a retail plaza. 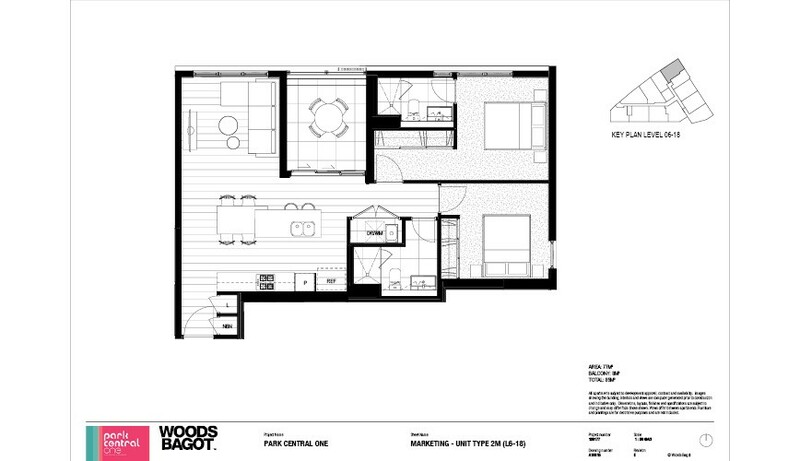 Apartments in the first building of the master plan, Park Central One, are priced from $360,000 for a one-bedroom apartment and $500,000 for a two-bedroom apartment. Future stages will provide more residential apartments and student accommodation. On the ground floor of Park Central One, there will be a 16,000m² retail precinct offering a full-line supermarket, dining options and specialty stores. 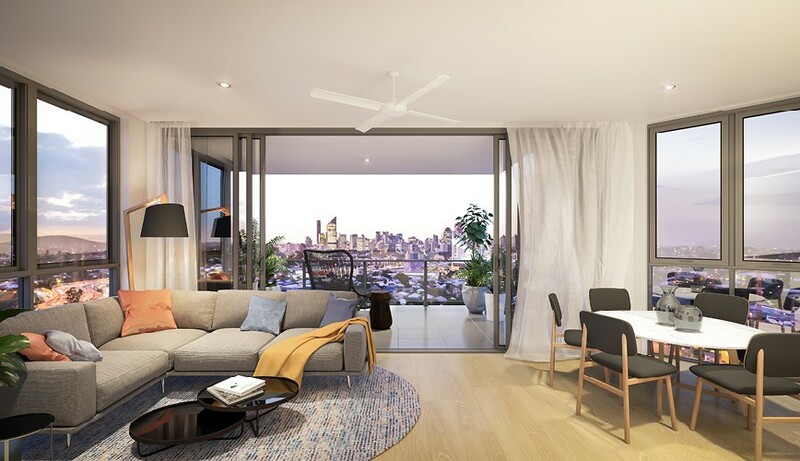 This off-the-plan development in Woolloongabba is ideal for Brisbanites who commute to the city — perfectly located for work and play. Located at 255 Logan Road, Woolloongabba. 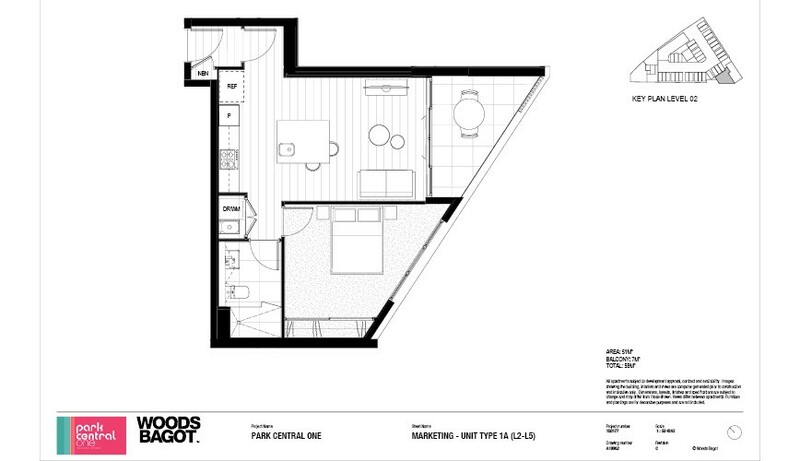 Park Central One has 168 one and two-bedroom apartments. Railway and bus stations are conveniently located at the doorstep of the development. 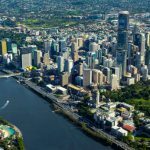 Within 10 minutes of Brisbane CBD, The University of Queensland, QUT and Griffith University. Park Central One city views from rooftop. Image by developer. Park Central One rooftop BBQ area. Image by developer. Park Central One living room. Image by developer. Park Central One kitchen. Image by developer. 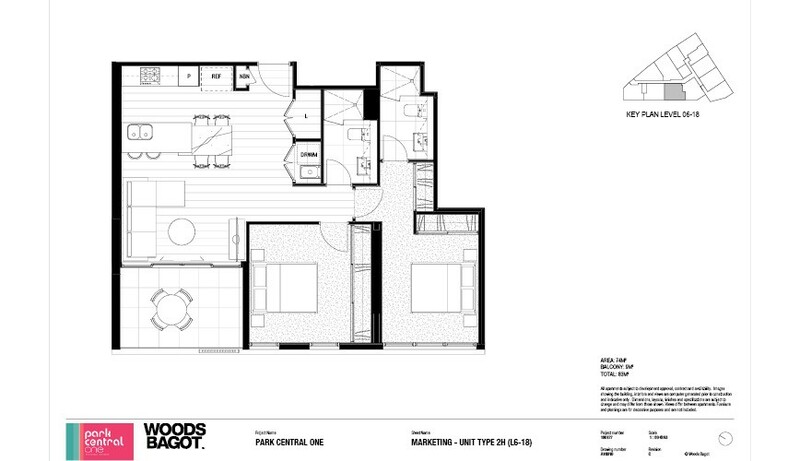 Park Central One kitchen, twilight scheme. Image by developer. 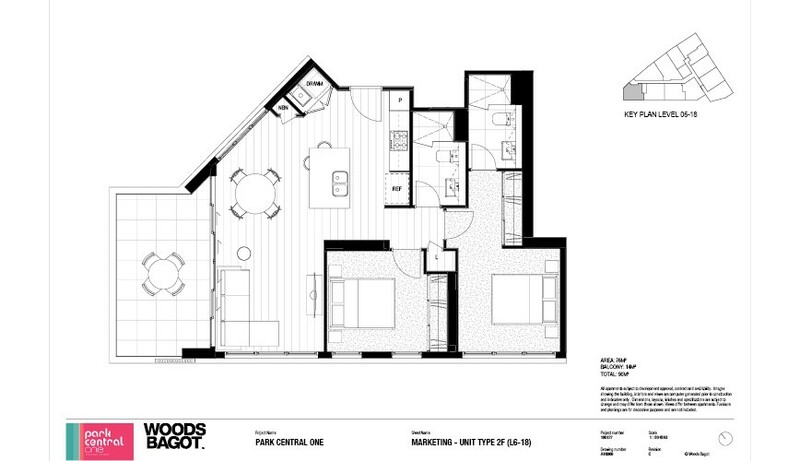 Park Central One kitchen, dawn scheme. Image by developer. Park Central One exerior building. Image by developer. Park Central One bedroom. Image by developer. 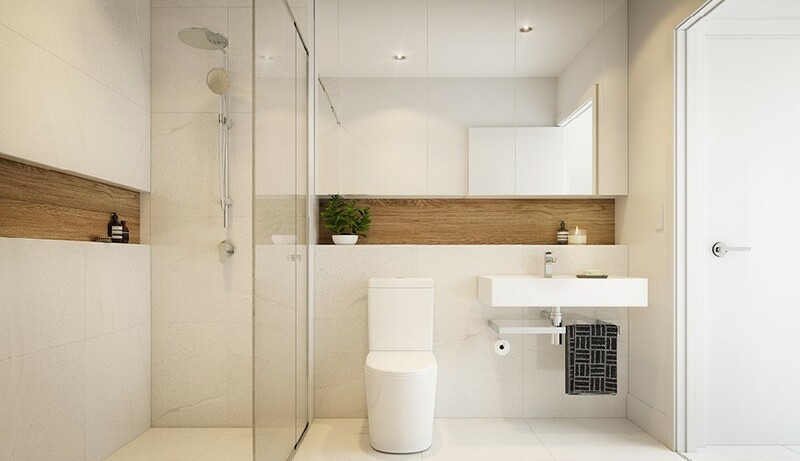 Park Central One bathroom, twilight colour scheme. Image by developer. Park Central One bathroom, dawn colour scheme. Image by developer. 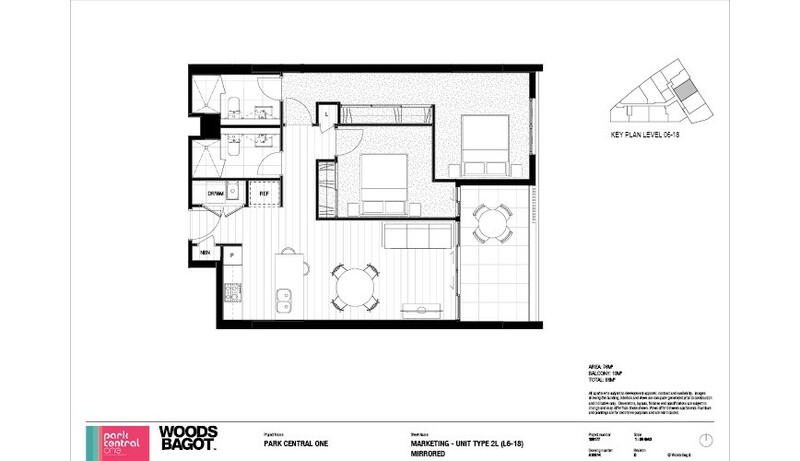 There is a display suite for Park Central One on site at 255 Logan Road which is open 10am – 4pm daily. 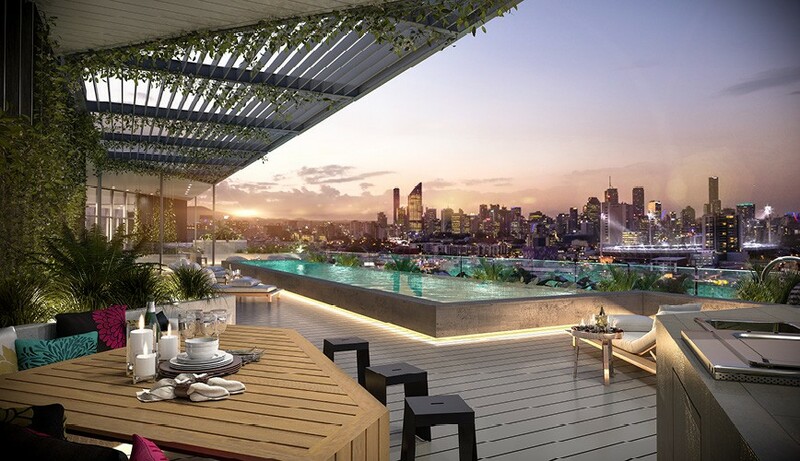 On the rooftop of Park Central will be a 4,300m² ‘sky park’ which will form a private recreational space. This residents-only area will feature a large 305m lap pool with an infinity edge and statement waterfall as well as a club lounge and outdoor dining areas. The rooftop will also feature a jogging track and outdoor gym, table tennis table, bocce and yoga lawn and outdoor cinema. Park Central One apartments are also pet friendly, and there’s a special off-leash dog park on the rooftop as well, to make life at Park Central One just as comfortable for your furry friend as it is for you. 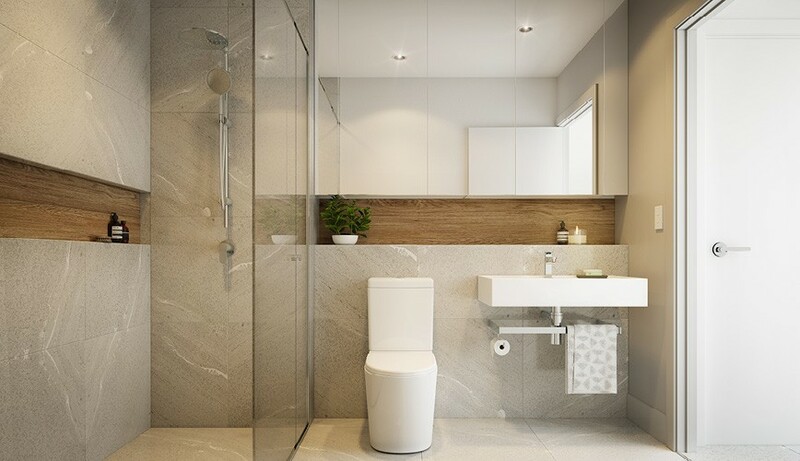 The first tower in the development, Park Central One, includes 168 one and two-bedroom apartments over its 18-storeys, along with ground floor retail and a private rooftop garden terrace with a swimming pool, gym, and deck area. 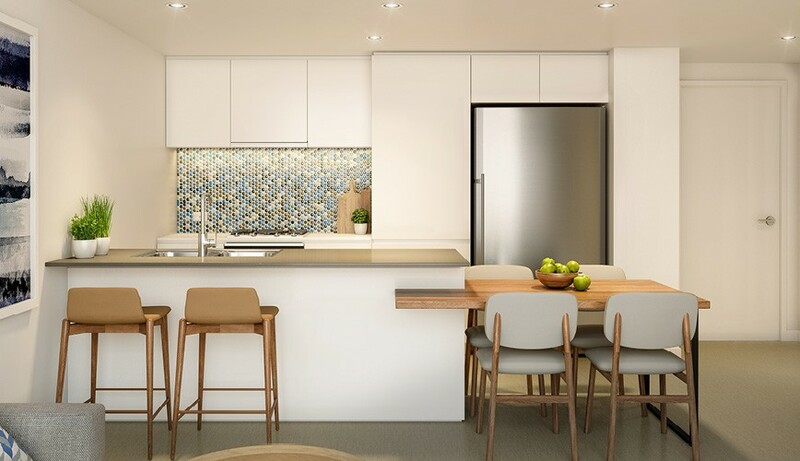 The contemporary off-the-plan apartments feature reconstituted stone island benches in the kitchen, Bosch stainless steel appliances, and floor-to-ceiling windows. 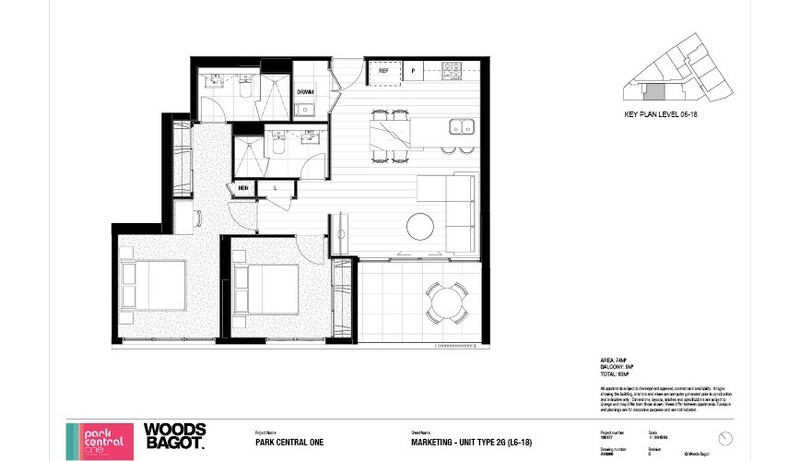 As of February 2019, 37 apartments have been sold so far in Park Central One. Construction at Park Central One has not yet started. Check back regularly for updates on the construction of this project. 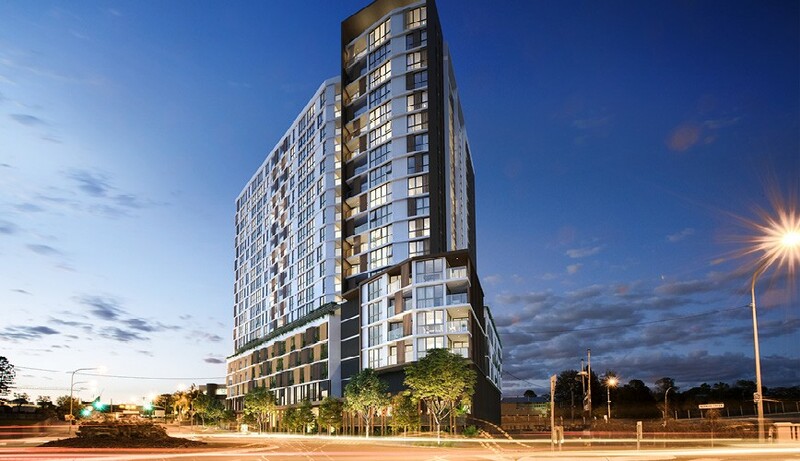 Park Central One is located on the corner of Logan Road and O’Keefe Street at the southern end of Woolloongabba, close to the border of Greenslopes. One stop on the bus from Buranda connects you to South Brisbane and two stops to the CBD. Bikeways link to the South East Freeway as well as the Norman Creek Bikeway and Greenway. Over the next few years, transport to and from the city from Woolloongabba will drastically change with the opening of the Cross River Rail network, making trains just as convenient as buses for locals travelling to and from the city for work. The location of Park Central One means it’s not only convenient for public transport, but there are many local amenities that are within walking distance. Stones Corner Village is only 450m away and offers plenty of sought-after amenities including many restaurants, a convenience store, ALDI, post office, hairdresser, florist and pharmacy. The Stones Corner Library is also just a few hundred metres walk away. Park Central One is situated in a very convenient location for health workers too, with the PA Hospital just 15-minutes walk away and the Mater Hospital just 2.5km away too. For more information on the Woolloongabba area, check out our Suburb Profile. 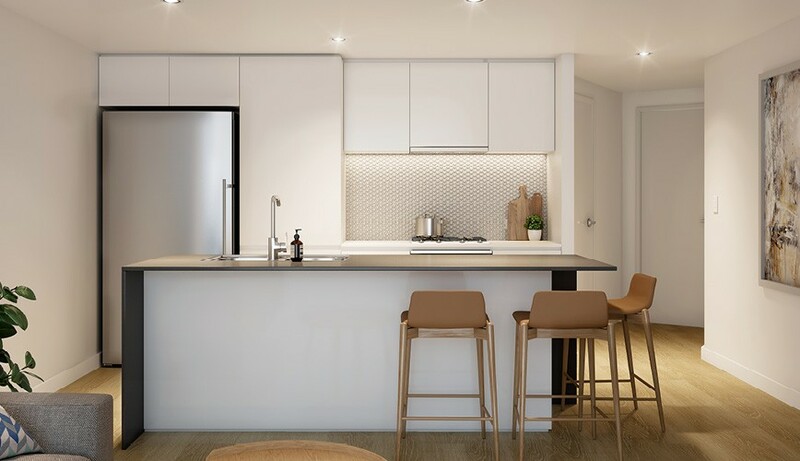 For more information on why Park Central One is located in one the best place in Brisbane (especially for medical professionals), check out our news article. 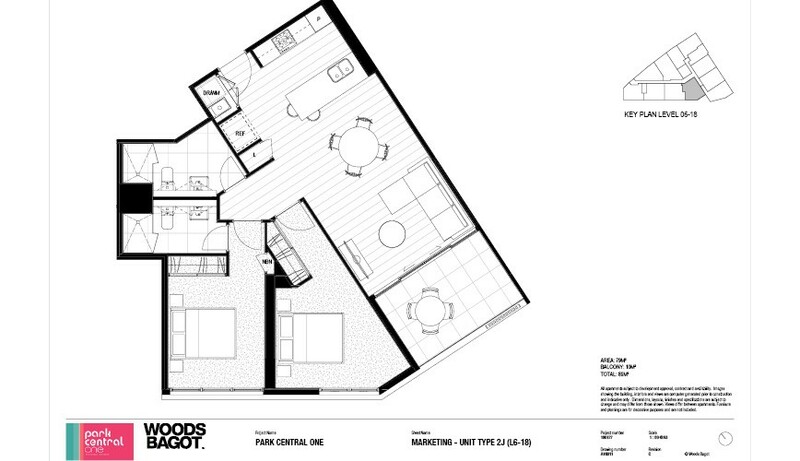 All apartments at Park Central One have been carefully designed to make the most of the space and the views. The open-plan living space is complemented by your choice of two modern colour palettes — dawn and twilight — as well as full-height glazing. 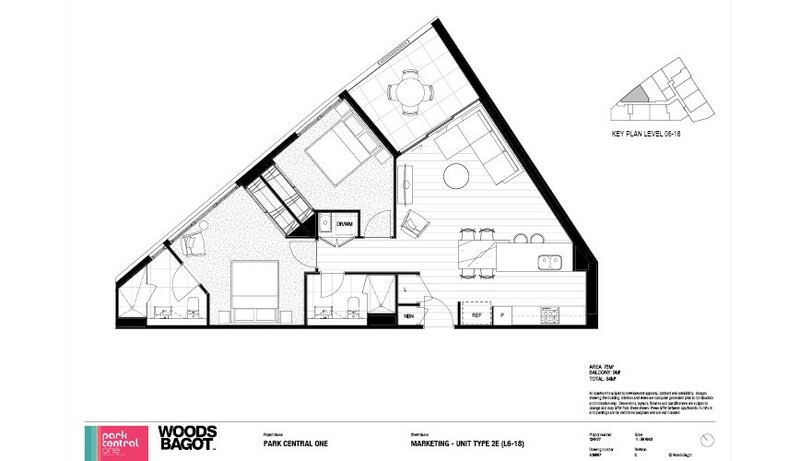 On each floor, there is a mixture of one and two-bedroom floor plans, with twelve apartments per floor. 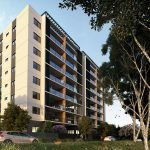 The one-bedroom apartments for sale at Park Central One are sized between 48m² and 55m², with balconies of around 8m². 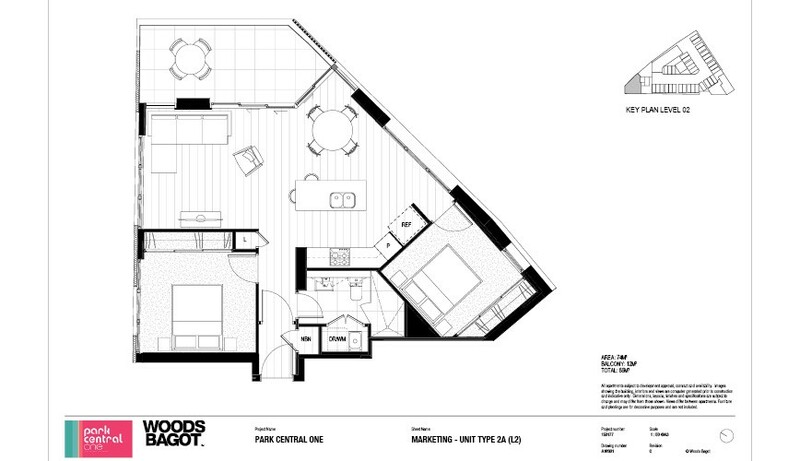 Comparatively, the two-bedroom apartments sit between 74m² and 95m² internally. 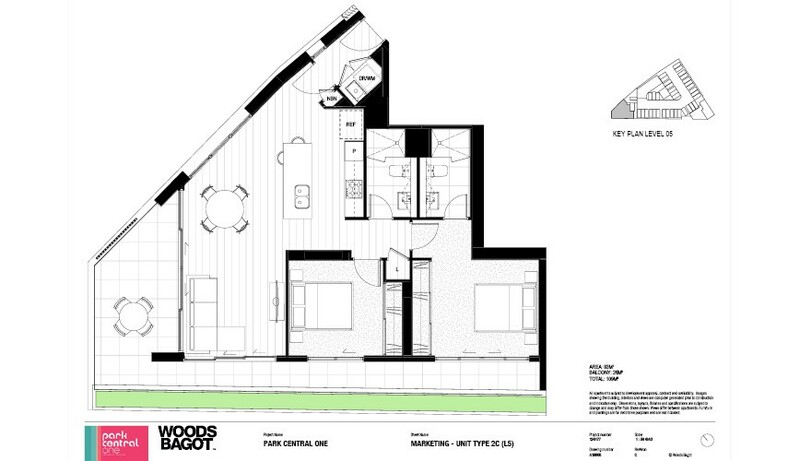 Balconies of the two bedrooms can be up around 26m², with an average size of 12m². 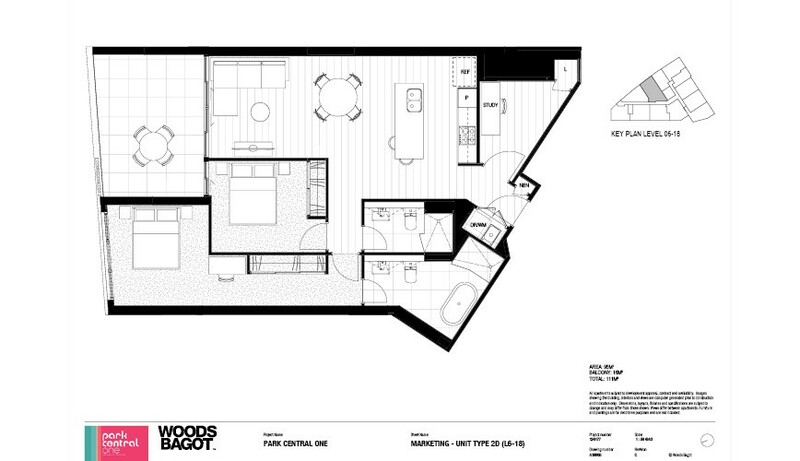 All two-bedroom apartments feature a large kitchen island as well as an ensuite off the main bedroom. In some of the larger two-bedroom apartments, there is a walk-through wardrobe and all bedrooms do have a built-in at a minimum. 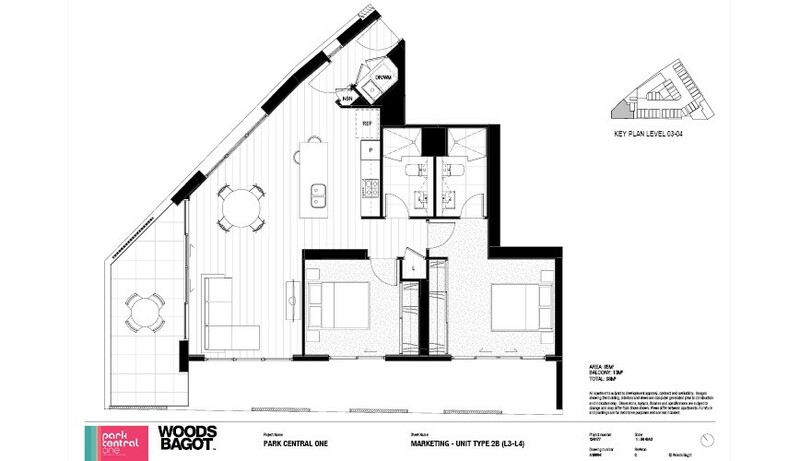 A number of the two bedrooms also have defined entryways which are a lovely feature. 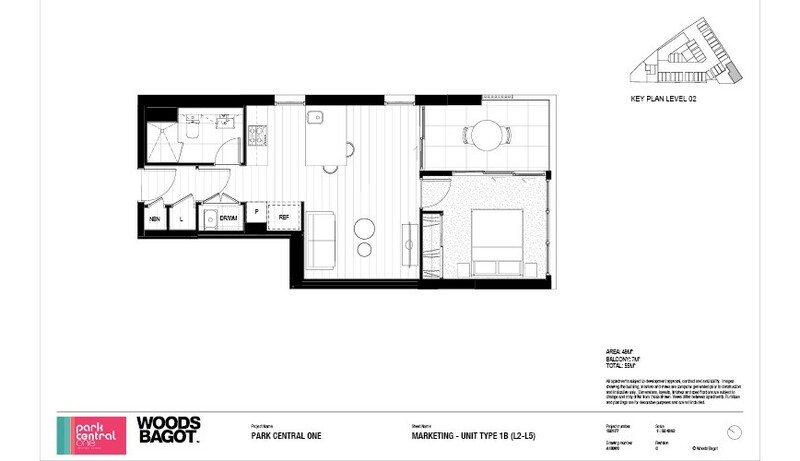 Both the one and two-bedroom apartments have an internal laundry cupboard and built-in pantry. 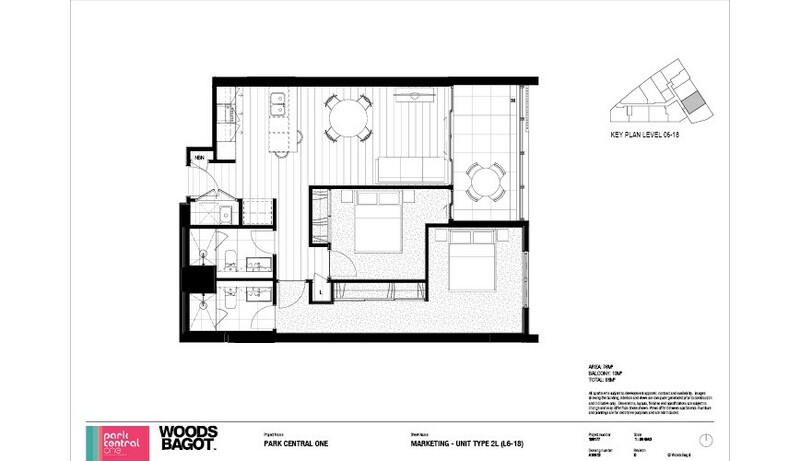 The apartments at Park Central One have ceiling heights of around 2.5 metres, with 2.3-metre ceiling heights in kitchens and corridors. There are ceiling fans located in all bedrooms and the living room and ducted air conditioning in the living room too. The condensers for the air conditioning are located on the roof, in the plant enclosure, or above the vehicle space in the car park. 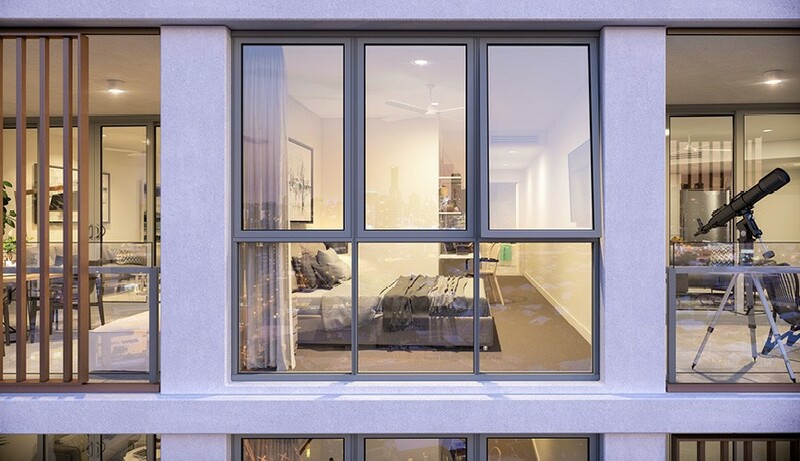 This means, although the balconies aren’t exceptionally large for the most part, residents will be able to utilise all of the space on the balcony. Underfoot, you’ll find wool-blend carpet in the bedrooms and timber-look resilient flooring in the kitchens and living spaces. There’s also an option to upgrade both the kitchen and living to feature tiles. 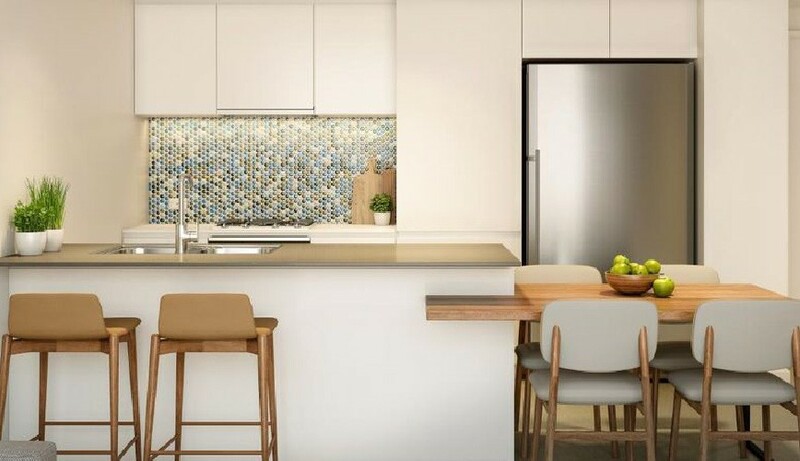 In the kitchen, you’ll find appliances by Bosch, including a four-burner gas cooktop and semi-integrated dishwasher, as well as a 20mm composite stone benchtop. 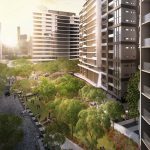 Also currently under development in Woolloongabba is the master-planned South City Square, which is on Logan Road too. As well as South City Square, there is a new offering with with a view directly into The Gabba Stadium at Silk One. If you’re looking for something to move in to now, construction is complete at The Wellington which is located at 45 Wellington Road and offers one and two-bedroom apartments. 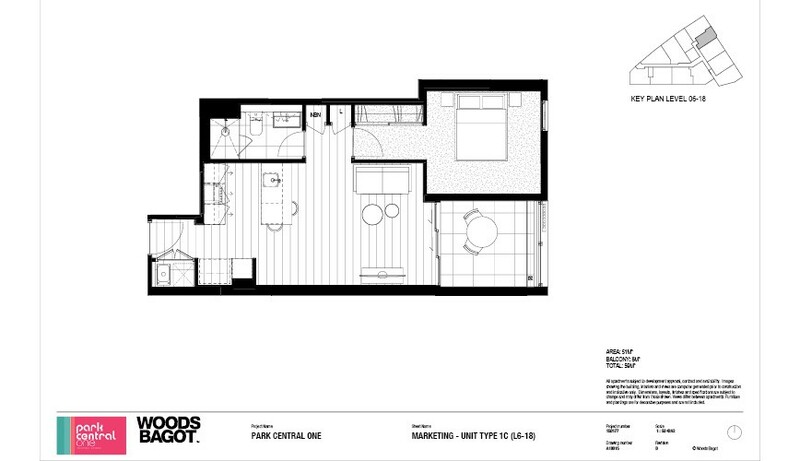 Body corporate at Park Central One starts at $3,150 per year for a one bedroom apartment and increases up to $4,380. This includes the caretaking agreement, admin fund levy and a sinking fund levy. 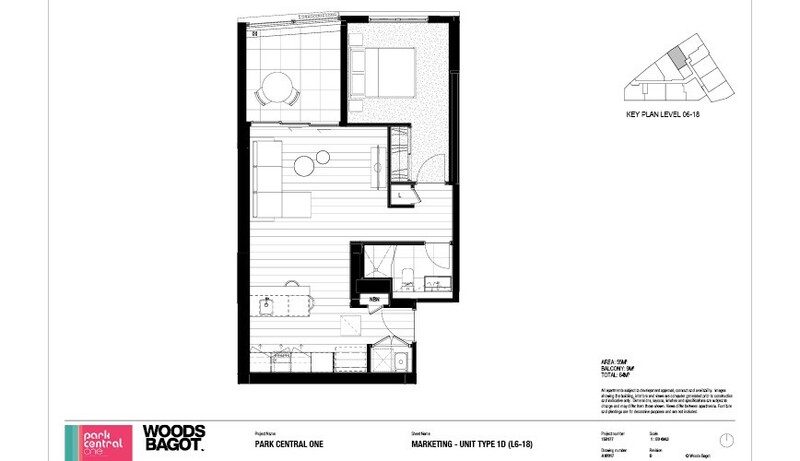 Weekly, body corporate at Park Central One apartments sits between $70 and $80. Park Central One is a project by Singapore-based developer Wee Hur. 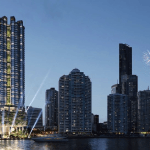 The land for Park Central was purchased by Wee Hur in 2015, and this master-planned development marks their first foray into the Australian market. Since the acquisition of the three plots in Buranda, Wee Hur has also purchased a commercial office building near King George Square in 2016. Wee Hur has more than 100 construction projects under their belt since inception and they have generated more than $1 billion of sales through their development arm. Currently, Wee Hur also operates one of the largest foreign worker dormitories in Singapore, with approximately 16,800 housed in one facility. 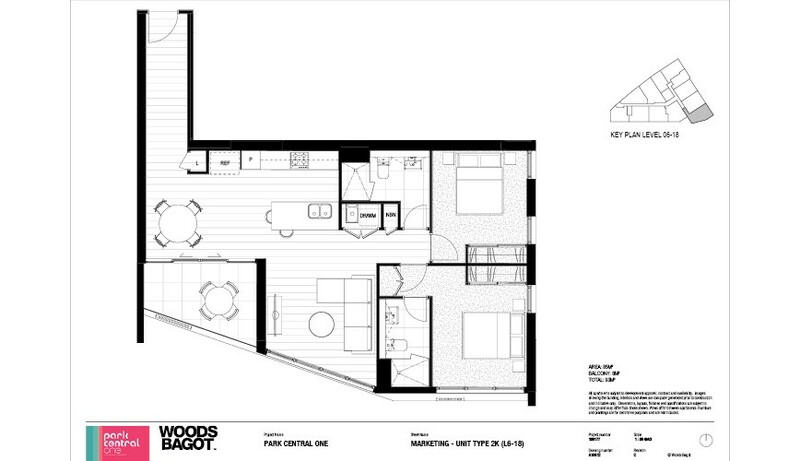 Architects at Woods Bagot designed the master-planned apartment towers and Tomkins has been appointed as the builders. 1300 528 888Click to display phone number.